Let’s start with pastors, like Garlow, openly endorsing political candidates. Nearly a third of Americans say they want houses of worship to back particular candidates, despite IRS rules that prohibit churches from doing so if they want to remain tax exempt. That’s an increase of 8 percentage points since 2010. An even higher percentage - nearly half of all Americans - said churches and other religious institutions should openly express their views on social and political issues, an increase of 6% since 2010. 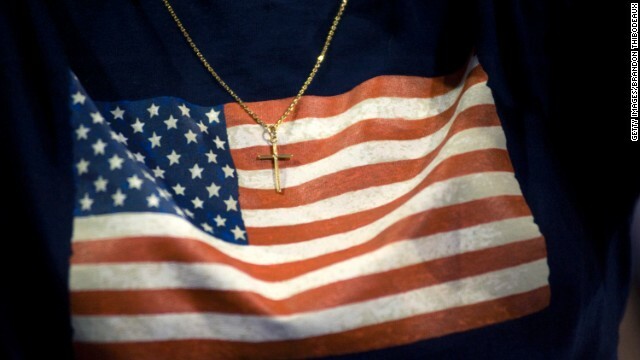 The findings of the Pew study contradict what seemed to be a trend toward increased secularization in American social and political life, surprising experts like Seth Dowland, an assistant professor of American religious history at Pacific Lutheran University in Washington state. Dowland hypothesizes that this increased desire for religion in politics might be due to President Obama’s perceived lack of religion — as compared with former President George W. Bush, at least. Though Bush made faith a major part of his public identity, Obama has not been quite so outspoken. This sentiment may have contributed to the increased support for religious leaders discussing politics from the pulpit. Garlow also pointed to the current political situation, saying that Obama and other left-leaning leaders have “overplayed their hands” by enacting laws that go against the desires of the people, or at least those of American evangelicals. The evangelical pastor cited the enactment of gay marriage in many states by court order rather than by a vote by the citizenry. Garlow said his sermons regularly include a range of political issues, including the national debt, support for Israel and abortion, although he said that more often than not, these politicized issues don’t come up at all. Over the weekend, he was specifically participating in Pulpit Freedom Sunday, an annual event in which pastors across the nation openly discuss “the intersection of the political realm with the scriptural Truth,” according to the website for Alliance Defending Freedom. It’s also meant as a test of those IRS rules against politicking in the pulpit, rules that conservatives like Garlow abhor. According to Alliance Defending Freedom spokesman Nick Bouknight, about 1,800 pastors participated in Pulpit Freedom Sunday this year. Though Garlow’s congregation might applaud these politically infused sermons, others are dismayed. “What about the integrity of the political process?” asked Barry Lynn, director of the nonprofit Americans United for Separation of Church and State. Lynn’s organization has lobbied the IRS to investigate churches that participate in such openly political speech and to revoke their tax-exempt status. But in recent years, the IRS has been reluctant to take that step. Even so, Lynn said he is not particularly concerned by the findings of the Pew survey, saying that the language of the questions was somewhat vague and could be interpreted widely. Lynn also said he was heartened that a great majority of respondents in the Pew poll - 63% - responded negatively when asked whether churches should go so far as to endorse candidates for office. In any case, megachurches like Skyline Church in California have become rich opportunities for conservative political leaders looking to appeal to a solid bloc of voters. “We’re seeing a greater consolidation of Christians into fewer and fewer (larger and larger) churches,” said Kate Bowler, a professor of Christian history at Duke University. Garlow says he is preaching the Bible, not politics.